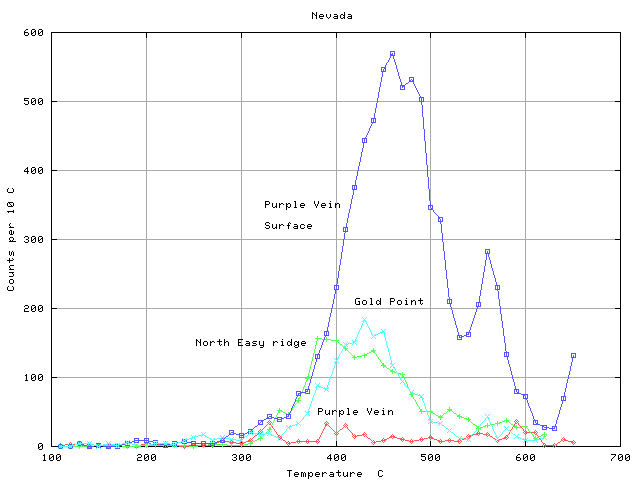 The Au deposits in Nevada are young and in contrast with typical archaen deposits they lack any significant CO2 in their fluid inclusions. 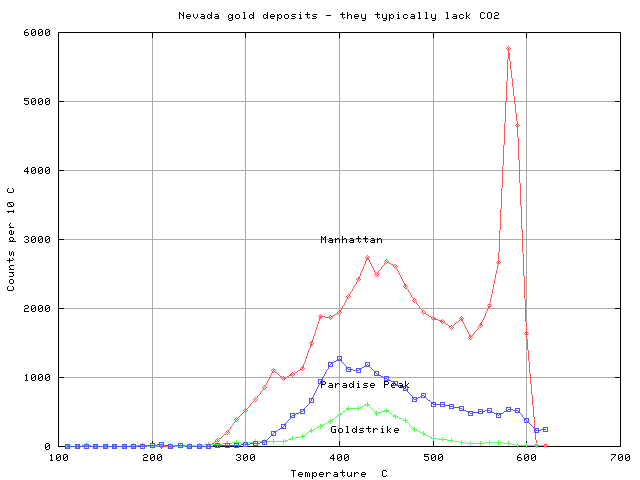 The samples from these 3 deposits, as well as jasperoid style deposits in Nevada, all lack any significant low temperature CO2 decrepitation peak. There are numerous jasperoid outcrops in eastern Nevada, most of which are simply surficial silicification, but some of them are gold mineralized and formed from hydrothermal fluids. Decrepitation can be used as a screening procedure to discriminate between these two types of jasperoid. The Cranovitch and Jaydee pits are small gold deposits in the Robinson district. The Purple vein deposit, in the Carlin district, was an exploration prospect when this drillcore was sampled in 1990. See the adjacent figure for some surface results at Purple Vein. An example of typical background jasperoid from near the Easy Junior mine shows the contrast between the mineralized and barren jasperoids. Within known deposits, most but not all samples decrepitate. Two samples from the Purple Vein deposit show the range of decrepitation which can occur, sometimes over quite small distances. 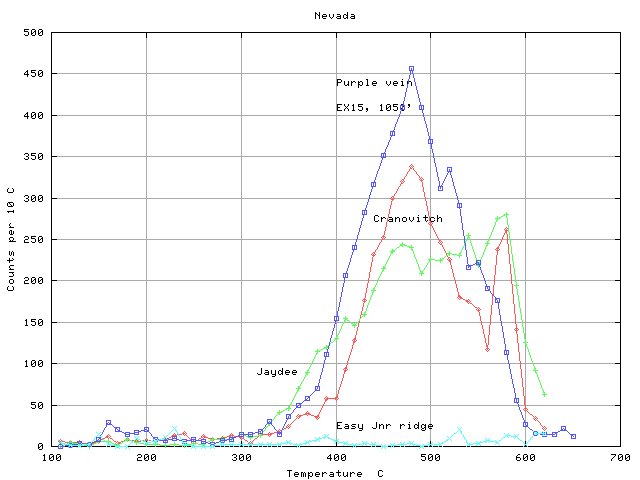 Some 50 samples of background jasperoids were collected in eastern Nevada and almost all of these had no decrepitation. The North Easy ridge sample is one of the few from outside of a known mine which did decrepitate. Samples from close to but not actually within mines also show no decrepitation activity indicating that there is almost no detectable anomalous aureole outside of the mineralized zone itself. Although decrepitation does seem capable of discriminating between potentially mineralized and barren jasperoids, a high sampling density is required to compensate for the lack of aureoles around the mineralized zones.